The largest power producers in China have asked the government to allow for the development of between 300 and 500 new coal power plants by 2030 in a move that could single-handedly jeopardise global climate change targets. It comes as coal-fired power capacity additions in 2018 slowed to their lowest rate since 2004, both in China and globally, though carbon emissions from the sector continued to rise, according to the International Energy Agency. In its review of the government’s five-year-plan, China Electricity Council (CEC) – the influential industry body representing China’s power industry – recommended adopting a ‘cap’ for coal power capacity by 2030 — but the 1300GW limit proposed is 290GW higher than current capacity. The target is for the country’s coal-fired capacity to continue to grow until peaking in 2030. The cap would enable China to build 2 large coal power stations a month for the next 12 years, and grow the country’s capacity by an amount nearly twice the size of Europe’s total coal capacity. If this happens it could single-handedly end any chance of keeping global warming below 1.5C, and also conflicts with the 2C target, with even a conservative analysis of the goal requiring that China cut its coal capacity by roughly 200GW by 2030. The Chinese government has not adopted the industry proposal, but it is under consideration. How does the industry proposal compare with scenarios that aim to limit global warming? 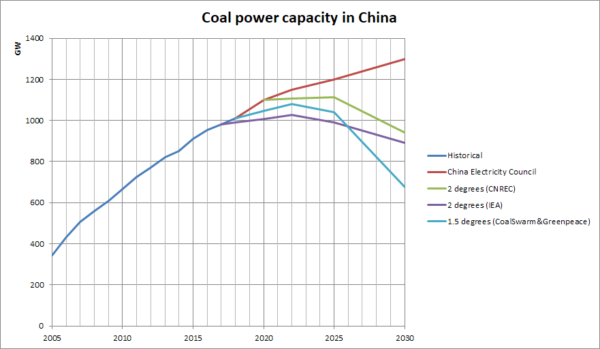 Both the China National Renewable Energy Center 2C scenario and the IEA Sustainable Development Scenario, a fairly unambitious emission reduction scenario that would be likely to lead to more than 2 degrees warming, have China’s thermal power capacity falling around 900GW by 2030 — a 200GW reduction from 2020 to 2030, as opposed to a 200GW increase proposed by the industry. A Greenpeace and Global Energy Monitor analysis found that in a scenario consistent with the reductions in coal use needed to meet the 1.5C target, China’s coal-fired capacity must fall by around 350GW from 2020 to 2030 to reach 680GW, taking the rapid development of renewable energy into consideration. The capacity proposed by the CEC plan is therefore almost twice as high as the level consistent with 1.5C. Analysis also suggests that at least 50GW of coal capacity will retire by 2030 – probably more like 200GW – which means that the gross addition of capacity under the CEC plan would be around 330GW to 470GW. 130GW is currently under construction in China, with an additional 30-40GW of projects that already started construction but were suspended or delayed due to Beijing’s various overcapacity policies. 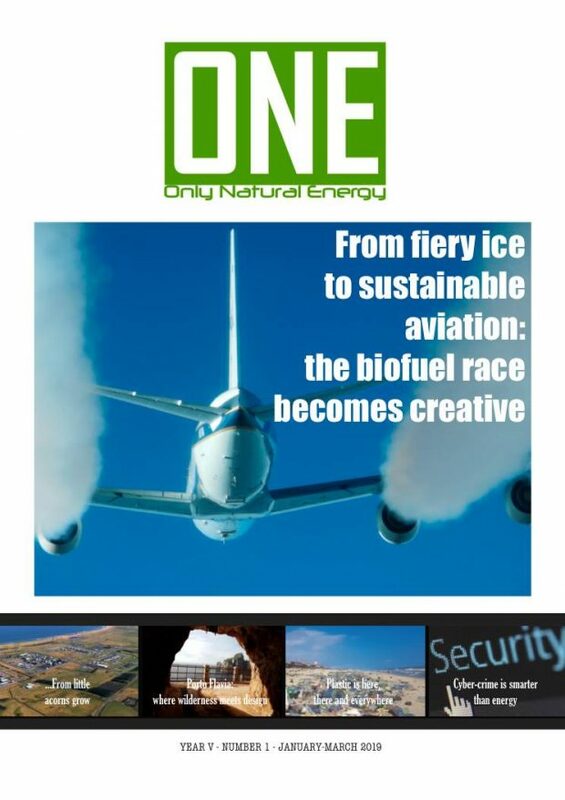 The industry is predictably eager to revive projects that the government put on ice to address overcapacity. The capacity target proposed by the CEC would mean not only completing all of this capacity, it would see the start of as-of-yet unplanned projects amounting to another 160-300GW. For context, the total German coal/lignite plant capacity is less than 50GW, while in Poland it is below 30 GW. The gigantic increase in coal-fired capacity is also reflected in the CEC’s targets for power generation: in 2035, the industry proposal would see power generation from fossil fuels up by almost 30% from current levels, while the emission reduction scenarios foresee a reduction of 30-50%. But the power sector is not the whole story: could the proposal be envisaging steeper reductions in industrial and other non-power-sector coal use? In recent years, the government has run aggressive programs to replace coal use in heating and industry with electricity and gas, which shifts more of the coal use to the power sector. This could offset some of the higher emissions in the power sector compared to the climate mitigation scenarios above. However, all emission reduction scenarios assume a substantial shift from direct coal use to electricity. Total power generation projected by the CEC in 2030 is only slightly higher than what’s projected by the IEA and lower than projected by CNREC, suggesting that the main reason why the CEC is proposing more coal-fired capacity and generation is not higher total power demand. The reason is that the CEC is promoting a much larger market share for coal (and gas) in the power sector and much less non-fossil power generation by 2030: CNREC’s 2-degree scenario has 77% non-fossil power generation by 2035, while the IEA says 70% is needed by 2030; while the CEC proposes a target of 50% by 2035. Furthermore, the clash between what’s needed for climate mitigation and this target goes far beyond the capacity level in 2030. In the mitigation scenarios, very few if any new coal plants are added after 2020. Under the industry proposal, around 400GW of new capacity would be added in 2020s, meaning that this capacity will be much less than a decade old in 2030, making rapid retirement less palatable. The review also requests the acceleration of gas-fired power projects, raising the target of west-to-east electricity transmission capacity from 270 to 300GW by 2020, nearly doubling targeted solar PV capacity to 200GW, and increasing wind power target marginally, from 210GW to 220GW. Science denialism is dangerous. But so is science imperialism.